Former residents warned their grandchildren of frightening goings-on in the upper storey of this historic home. Is there something lurking upstairs at Laishley House? Onehunga is a suburb of Auckland City in New Zealand and the location of the Port of Onehunga, the city’s small port on the Manukau Harbour. It is eight kilometres south of the city centre, close to the volcanic cone of One Tree Hill (Maungakiekie). The residential and light-industrial suburb, with its approximately 18,000 residents and almost 1,000 commercial and industrial businesses stretches south from Royal Oak to the north shore of the Manukau Harbour. To the east are the areas of Oranga and Te Papapa; to the west, Hillsborough. On the southern shore of the Manukau Harbour and linked to Onehunga by two bridges is the suburb of Mangere Bridge. 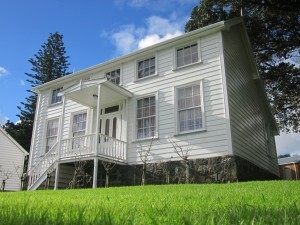 Laishley House, a two-storied home, was built in 1856 as the manse for the first minister of the Congregational Church, Reverend Richard Laishley and his family. It’s now owned by Auckland City Council and was moved from Princes St in 1985, close to the old library (which is now a café) and was moved to its present position. 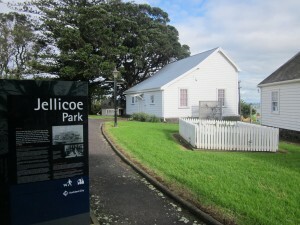 The house and two others in Jellicoe Park are open for viewing on the first and third Sundays of each month between 1.30pm and 4pm. Laishley House was an interesting building with a kitchen, lounge and bedroom having been fully restored to replicate how it would have looked in the era of Reverend Laishley. The other rooms were set up to display artefacts from that that time. Upon entering there was a kitchen/dining area set out in family style. There was a small office to the left and down the hallway were a set of stairs, a museum type room to the left and a lounge room to the left. 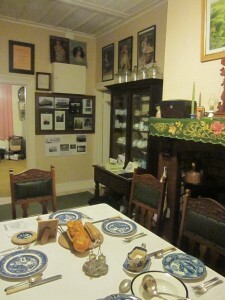 The lounge room was set up with furniture and mannequins to depict a family home. Up the stairs there were two bedrooms. 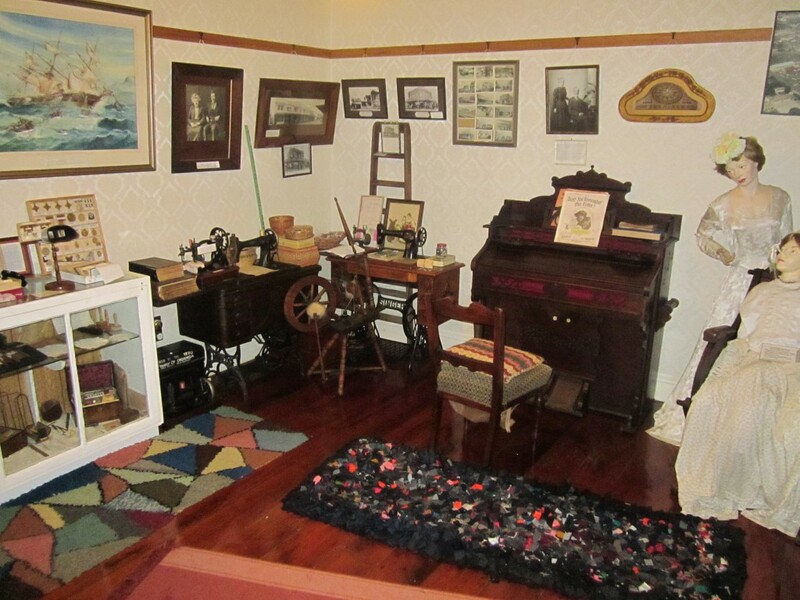 One was displaying memorabilia from early Onehunga and the other had been set up to depict a childs bedroom. All items in the house have come from the Onehunga area. It once had a full veranda in the front but it was knocked off when the building was moved and the council took that opportunity to replace the veranda with a porch (which was what it had when it was first built!). One of the stories state that just after the house had been opened to the public, a family whose grandparents had once lived in the house came for a look through. 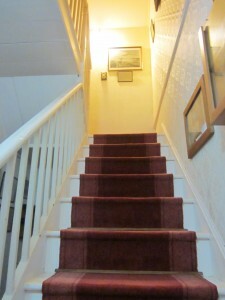 They said it was the first time they had ever been upstairs, as when their grandparents lived there they told scary stories of things that happened up there so the children never went up the stairs! Team members on this investigation – Barbara, Mark, Jacalyn and guest, Chris. Weather conditions on the night: Heavy rain during the day that eased off to light periodic rain in the evening. Luna Cycle: Day before first quarter. The Haunted Auckland group arrived at Laishley House and after a quick talk with the caretaker of the building did a short investigation of both Laishley House and then the Block House. We went through the house taking photos, video and audio recordings. Static IR cameras were placed in the kitchen and upstairs bedroom and relocated into different positions midway through the investigation. Audio recorders were left running the entire investigation in the same two rooms. Hand held cameras and audio recorders were used on walkabout. Atmospheric and electrical field readings were taken at various points during the night. Laishley House is a white building on brick foundation with a small porch leading to the front door. The main entrance used for guests, is at the rear, which is also where we entered. Each room in the house has been kept looking to the era of when the house was originally built allowing visitors to see what it was like in that time. On first entering the building you move directly into the kitchen and dining area. This is one of the few rooms where the is obvious upgrades from a failed attempt to make this room into a small cafe for guests – the kitchen not only housing a new modern sink but also hot water zip on the wall. Other than that the room is entirely period. The room directly to the left is the reception and office, housing a lot of books and records. Walking directly ahead down a small passage there is a staircase leading upstairs to your left, the front door ahead of you and a door to either side leading to two different rooms. The room to the right is set up as a family room, the one to the right is more of a study with displays for people to view. Upstairs there is similarly two rooms, the one to the right having been set up with displays and the one to the left a bedroom. 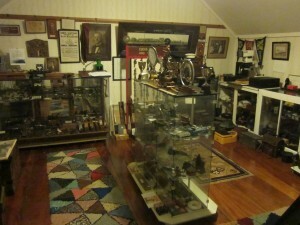 Each room has tried to stay as accurate to period as possible to show how the house would have looked while also trying to display other items from the era that wouldn’t have necessarily been found in the house. Barbara – Laishley House had a nice welcoming atmosphere. It felt like a family home. 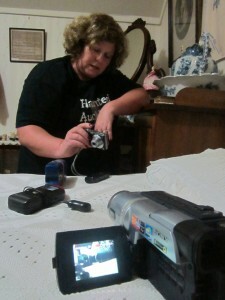 In the upstairs bedroom I tried an EVP session while placing my studfinder on the bed beside the recorder. We seemed to record (at times) intelligent responses to questions. We did attempt communication using a spirit box but did not get any clear response. Jacalyn – I found the inside to be very well maintained, though a little cluttered. The house is set up as a museum in the era of when it was built but they are trying to fit so much in that I found it a little inundating in places. The house is obviously well loved and maintained by those who care for it. The room that stood out most to me would have been the one set up as a family room. When stepping in, it was like a wave going through you and the room felt different. The room was markedly colder and darker than the other rooms. Though originally though this could be from a draft created by the back door being colder, it didn’t seem to make much difference to the temperature in the room once it was closed. This room also stood out in regards the sheer number of mannequins in the room. Each room had a couple of mannequins dressed in period clothes in each room, but this one had a much greater number of them in comparison to the other rooms. Each one them were different, but all facing the centre of the room where most would stand. During our first EVP session of the evening in the family room at Laishley house I saw a small white dot shoot from Barbara. The group was all sitting on the floor and I saw the small white dot move quickly from Barbara’s T-Shirt to her right for arm. It was after mentioning this that Barbara said that her right arm felt colder. What I saw was tiny and looked almost like a firefly with its quick movement. At the time there were no car headlights coming from the street, and not wearing contacts it couldn’t be a reflection. It was just after this that I to noted that my right felt colder as well. Though this could have been nothing, it is interesting due what I saw moving to Barbara’s left forearm then her realising that her arm felt cold in the same area. When entering the room set up as a family room, it was obviously colder. It felt like a wave of cold pass through me the moment I stepped in. It was thought that the temperature difference between this room and the others room may have been caused by the back door being open, but even after closing it there was still a difference. Barbara felt a cold spot in one location of the room. Photos and temperature readings were taken to see if this could be confirmed. A stud finder was set in a room on one of the beds. Our guest, Chris noticed that the light of the stud finder was going off. It wasn’t going off strong enough to make the sound go off, but the red light was obviously flickering. The group monitored it capturing everything on camera, and after eight minutes it was evident that if anything had been causing it, that it had left. Barbara – I really felt that the upstairs bedroom was the most active room in the house. During our investigation of the lounge I did sense a coldspot in the lounge. It stayed for a couple of minutes then was not noticeable again. We seemed to have been getting some intelligent responses to questions when we used the studfinder we are trialling in our experiments. I put it on the bed and asked if anything there could make the light go on. The lights flashed between one and two and at one stage I had all lights on (just for a second or so). I seemed to be getting intelligent responses to my questions, however whatever was happening stopped quite abruptly and the device remained unlit and silent for the rest of our investigation. I recorded the whole investigation including various EVP sessions that were done in the lounge and bedroom of Laishley House. 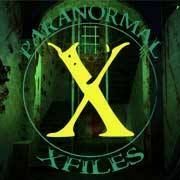 We asked questions which would help us ascertain the identity of any spirit we had possible contact with and questioned their attachment to the building. 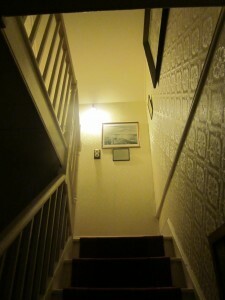 Mark – It was a quiet and peaceful house with the only notable activity for the night being the ‘stud finder’, sitting on a bed in one of the bedrooms being set off, seemingly on cue of a question or two being asked. However it didn’t really repeat and seemed random in its timing, so it may have just been coincidence. It was a cool night so I didn’t notice any further drops in temperature. Though, upstairs definitely felt slightly warmer to me, but only by a notch. Barbara – Jacalyn thought she saw an orb in the lounge at Laishley House and Chris thought she saw something like an orb in the meeting room at the Blockhouse. However, I did not see anything unusual. It went well. We had a small group who worked well together. We covered all areas of both houses and used a good variety of equipment. I found it really useful to have both Jackie and I recording the whole investigation as it meant that we could cross check our recordings after the investigation to see if we had both recorded the same sounds. I think we could spend more time in the upstairs bedroom if we ever return. When we left the investigation I had thought that possibly Laishley House may have an intelligent haunting and that I would like to revisit the upstairs bedroom at a future date to carry out a more extensive investigation. 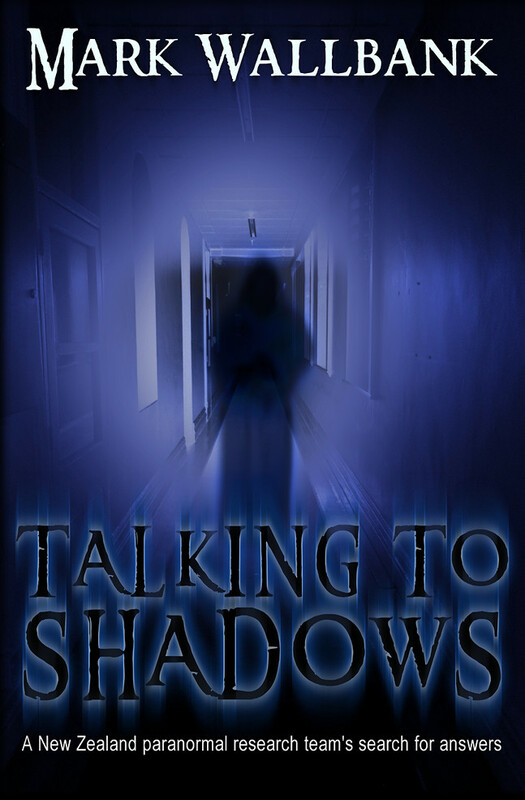 Jacalyn – Not much happened during the investigation, but I hadn’t anticipated much happening either. 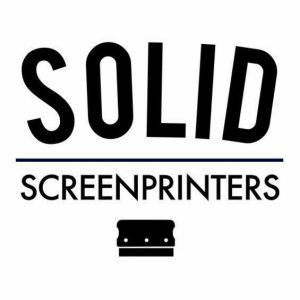 I feel that it went well, and we were able to spend equal time in both locations and due to the smaller size of each building we weren’t rushed and were able to take our time. It was good to see a wide array of items used even if nothing was picked up on as it gives a base line to compare against for future investigations. I hadn’t anticipated such history with either building and did enjoy what was on display at Laishley House. Though the building was quiet, and no obvious activity was experienced, this didn’t mean it was a waste of time – or that there is nothing there. It’s only in locations with little to no activity that you get the chance to properly test out certain pieces of equipment and gain a baseline to show how they react in a quiet environment. This also meant it was the perfect opportunity for our guest Chris to experience what it’s like being on an investigation. I feel that there is a chance that Laishley House may have something residing there, but if there is I’d say it would be residual. Mark – On this session I didn’t feel anything was out of place or unusual. Room temperatures stayed pretty much constant the entire evening. EMF field readings were normal and low, except around the older style light switches. On review of my audio and video footage, I have found nothing that stands out. We did hear a few knocks and creaks, though as it was windy outside at the time, and the fact that the house is old, wooden and situated up on an open and exposed hill, we could put this down to being possible natural building movement. From the lack of activity and unexciting field data collected in the house in the time we were there and the easily explainable noises we heard, I’d have to say at this point that Laishly House isn’t haunted, though, in the dark and due to its isolated positioning and location, I can see how it would gain its ‘spooky’ factor if viewed in the right circumstances. It was a good easy-going investigation, very relaxed and those that attended worked well together. Definitely worth the trip out in the wet and cold. Laishley house is a beautifully displayed and lovingly looked after piece of history and a fascinating look into early Auckland life. 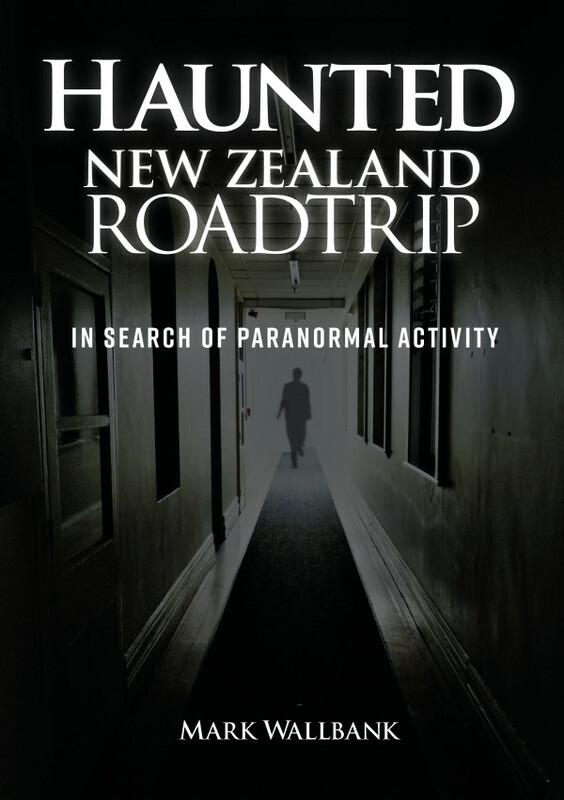 Haunted Auckland recommend you pay a visit when next passing through Onehunga. This sounds really interesting. Do you let the public in on these investigations and how often. Any information would be really great. Thanks. We occasionally conduct public investigations throughout the year. Stay tuned to our Facebook Page for the latest updates.